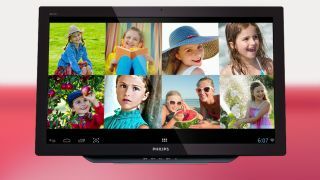 The Philips S231C4AFD is a versatile Full HD smart all-in-one monitor. With a Quad-core processor and Android 4.2, it doesn't even need a computer to connect to the internet. The touch controlled monitor produces sharp, flicker-free progressive scan pictures with superb brightness and colours, complemented by excellent stereo sound - perfect for streaming HD movies. The Philips smart all-in-one can be adjusted to a near-horizontal position on the table top, or positioned upright for working or viewing at a desk. And with direct access to the Google Play Store, you're just a touch away from an entire world of gaming, entertainment, social networking and more. The whole family can enjoy playing their favourite Android games with the spacious screen and full-touch capabilities - and stay connected with friends through social networking apps. For your chance to win this brilliant Full HD smart all-in-one monitor, just click here and answer one simple question.